As Richard Linklater's twelve-year journey to document the human experience in our most formative of years comes to a close its main subject literally stares into an indeterminable distance and metaphorically across a horizon of endless possibilities. There is something serene about this final note, something not so much uplifting as it is promising though I suppose the promise of possibilities could stimulate such optimistic feelings. To be honest, it feels somewhat intimidating to even try and craft a response or essay around the epic that is Boyhood. There is a distinct looseness to the project that doesn't adhere it to the serious, more prestigious films that have been straddled with the title of epic, yet it is most definitely that. Filmed over the course of twelve years using the same actors Linklater has pieced this unique project together as he went along, letting it develop naturally and in this organic sense of what life is, where it's going and what it becomes Boyhood feels wholly unique in a way no other film can touch. The question though was always going to be if whether or not the final product of what the film turned out to be might ever match the ambition of the idea behind it. As much as I feel intimidated by the film and everything it represents that I in no possible way could hope to capture in a few short paragraphs was still worried it wouldn't be all it was built up to be. There was such praise, such interest, such unanimous passion for this film that it felt it would be a crime to take any issue with it. As the film began to roll and the groove became recognizable though I could only hope it proved in some way to surpass what I thought might unfold, that it might take me by storm and bring me into what everyone else was seeing. Needless to say, I think I understand where they are all coming from. As that aforementioned final scene is let loose upon us and we know the end is near it all begins to sink in, what we have just experienced. There isn't a particularly significant story at play here, but it is meaningful in that every person in the audience can in some way relate to one of the characters, situations or emotions that unfold through the life of Mason and in turn we feel a part of this film. A transcendent experience, more than any numbing or even thought-provoking entertainment could provide. share some precious time together. As much as this is a film about growing up it is also very much aware of the time period in which it exists and is therefore something of a time capsule of a film. We begin in 2002 as we meet six-year-old Mason Evans Jr. (Ellar Coltrane) and his older sister Samantha (Lorelei Linklater) who are living with their mother Olivia (Patricia Arquette) in small-town Texas. Early on we are privy to the conversations of Olivia and her current boyfriend that spell nothing but bad news for the ultimate outcome of the path she is currently on. In a moment of realization, as this is clearly not the first time Olivia has had an argument revolving around her children with a new boyfriend, she picks up the family and moves to Houston so she can attend college and be closer to her mother all while hoping to make a better life for them. Their father, Mason Sr. (Ethan Hawke) is said to be off working on a boat in Alaska, but appears after the move to Houston clearly intent on becoming a presence in his childrens lives. It is made clear why the relationship between he and Olivia didn't work, but it seems only because Mason Sr. wasn't mature enough to be the man Olivia needed him to be, and in 2003, likely still isn't. As the years pass and Olivia gets closer to graduating she one day takes Mason to class with her, introducing him to her professor, Bill Welbrock (Marco Perella). Before we know it, Olivia and Bill marry and blend their two families, including Bill's two children from a previous marriage. The pattern continues though, even with as successful a man as Bill, Olivia can't seem to crack the code of life that would allow her both a partner who supports her and treats her children with no inhibitions of his own. To go on describing the events of what occurs would be mundane in this context because it is the natural evolution of such events and watching them play out on the big screen that make Boyhood so intriguing. In these early years the groundwork is clearly laid for how the arc of each character continues to evolve as well, never really ceasing because we are all always learning and adapting. I can only imagine what it might have been like to stick with the same characters for such a period of time, but in doing so and in seeing Coltrane grow up in front of our eyes they never come off as performances. Sure, we recognize Hawke and Arquette, but even with them we become lost in the narrative of this life. That, in essence, is what makes the film so remarkable. Linklater could have gone out of his way to not only create this film over the period of time he did, but also to think up a more abnormal story that would have no doubt fallen into conventions in the third act, but instead he simply allows the story to be the process of childhood. It's hard for us to think of this as a "story" necessarily, but it is. Linklater had to create a throughline narrative that stayed true to who these people were and who they might become. You might say the film could be classified as an almost-documentary or is nothing more than a collection of snapshots throughout adolescence, but what it really is is a piece of art that points out the after-affects of lifes "big moments". 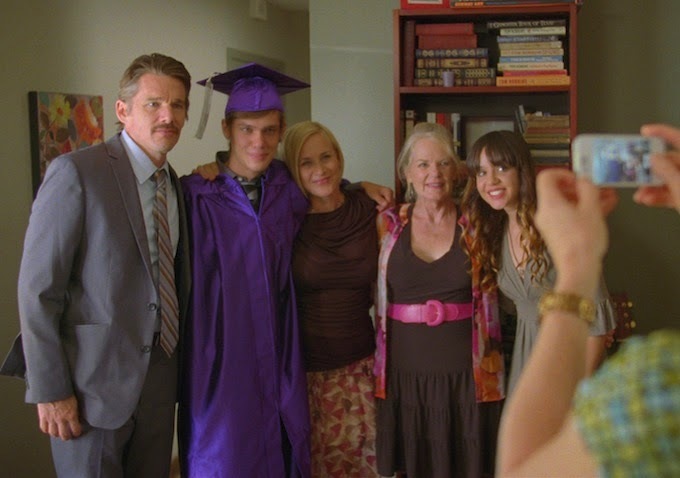 There is never a scene in which we see the characters of Boyhood go through what we might regard as major moments (graduation, wedding, birth), but rather we see the more intimate moments that follow these instances. There is the return of Olivia and Bill from their honeymoon rather than the ceremony where Mason and Samantha likely participated, there is the birth of Mason's step-sibling when his father re-marries of which Mason was likely present for and there is of course Mason's graduation but we never catch a glimpse of the more ceremonial events, but rather how life has adjusted itself after such events take place. This is clearly a directorial decision in that it creates a more personal relationship between the audience and Mason or any of the other characters you might better hold a bond with, but in exposing these characters in their more private settings we more and more see them as a surrogate for ourselves. Even if they are not exactly like us, we have all experienced something similar to the "story" elements involved here and in turn even if we don't come at those experiences from the same perspective as Linklater and his actors guide their characters to do we see the decisions we've made in similar circumstances allowing us to evaluate our own lives to this point so far. celebrate Mason Jr.'s High School graduation. 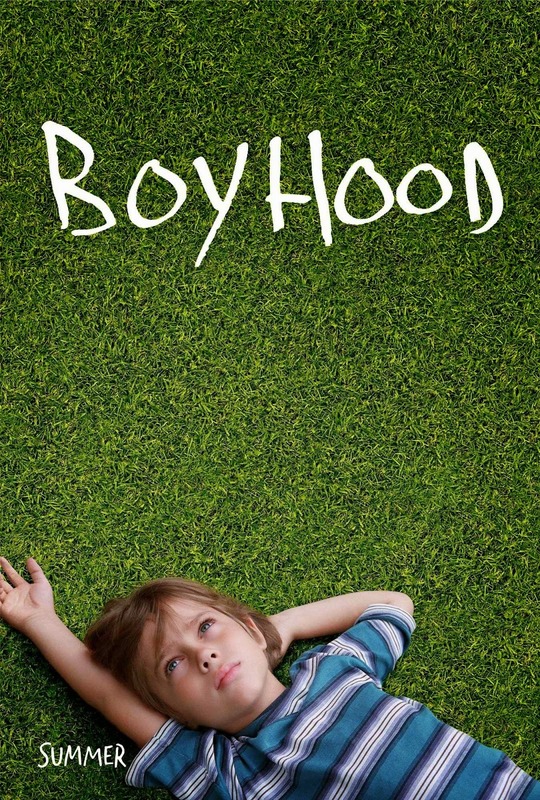 Boyhood is an ode to growing up and parenting. It is a trip through nostalgia over the first decade of the new millennium. It is not about the story, but more the fleeting feelings in each moment of our lives. It is about moments in that they are constant, a promotion to inspire the idea that there are always an abundance of memories to be made. All of this talk of nostalgia, of capturing a moment makes one wonder why such importance is placed on these things we call memories. It can of course be deduced that the reason is these are the things that make up our human experience, but what it is about Boyhood that makes it stand out more than the "gimmick" of creating it over twelve years is that it highlights the moments in our lives where we don't always strive towards what our ambitions reach for. Just because you don't have what you might want doesn't make that time in your life wasted time, but instead your character hopefully turns it and does with it something that might lead to an even more invigorating experience. Each of our characters illustrate this at one point or another with our central focus, Mason, simply attempting to figure out how to become who he wants to be in an environment that sees his parental figures constantly being disappointed. As Coltrane ages we see the leniency towards the arts and his philosophical mentality begin to develop leading to conversation that is reminiscent of Linklater's Before trilogy. Hawke keeps in line with the prolonged adolescence of the male species only eventually acknowledging that things might have worked out between he and the kids mom if he'd become who she wanted him to be sooner. Arquette though, is the real scene-stealer here. Her awareness of the stages of life and need to become something she feels is respectable is what hinders her relationships and yet when we reach the emotional moment as Mason leaves for college she still feels unsatisfied despite moments of content. We see her and Hawke, as much as the children, evolve from not knowing what they're doing in life to finding what is at least a comfortable place to fit into the world. Linklater is the real star though for he has created something as magical as the whales of the ocean, a true one of a kind.